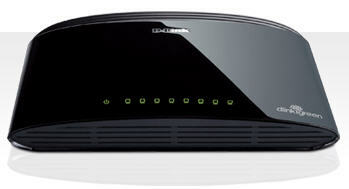 The D-Link 8-port Gigabit Switch (DGS-1008G) is part of a new series of Green devices using D-Link Green technology. Created with the Small or Home Office (SOHO) user in mind, the DGS-1008G saves energy while reducing heat output, providing you a longer product life without sacrificing operational performance or functionality. The DGS-1008G 8-port Gigabit Switch helps you conserve energy automatically through several methods. It automatically powers down ports that have no link activity, allowing the switch to save energy by cutting power usage for unused ports or ports connected to computers that have been shut down. It can also detect connected cable lengths and adjust power usage accordingly, helping you save energy without effecting networking performance. The 8-port Gigabit Switch was designed with the environment in mind. It is compliant with energy Star level V, as well as with the strict CEC and MEPS regulations that require the use of energy efficient power adapters. The switch is also built to follow RoHS standards to minimize use of hazardous materials, and uses recyclable packaging that helps reduce waste, complying with the WEEE directive.